Juan Mari Arzak is the owner and chef of Arzak restaurant in San Sebastian, Spain, and was one of the first Spanish chefs to be awarded 3 Michelin stars. The restaurant is now rated 8th best in the world, and Juans daughter Elena, who cooks with him, was voted best female chef in the world in 2012. They both studied with the great chefs of their day Juan in France with Paul Bocuse and the Troisgros brothers; Elena with Alain Ducasse, Ferran Adria and Pierre Gagnaire. What we eat, how we eat, is in our culture, says Elena, our signature cuisine is Basque. Our taste is from here. We were born here. We cook unconsciously with this identity. Thus Arzak is considered to be one of the most influential masters of the New Basque cuisine, which has continued to have a major influence on international cuisine, particularly on such world renowned chefs as Ferran Adria, who took the techniques pioneered by Arzak to new heights. 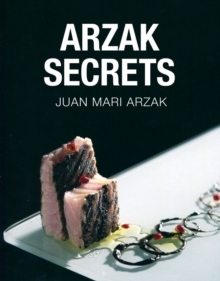 Originally published in Spanish and now available in English for the first time Arzak Secrets is THE behind the scenes recipe and technique book from the world famed restaurant. Gorgeously photographed, this volume is a glimpse at some of the secrets behind the dishes that have made the restaurant and chef famous. Arzaks kitchen is a laboratory for flavours, aromas and textures, and his dishes and techniques are revealed in this fascinating cookbook, which is not only for professionals looking for inspiration but for any dedicated cook committed to understanding the creative development and innovations behind this exceptional food.